I came back to see what looked like a snowstorm. . . in our living room. Our lovely dog, Daisy, had ripped up one of our couch pillows, leaving in her wake couch cushion carnage. This was probably not a big deal when looked at with some pen-tip perspective, but it came as the last straw on a trying week. Atop the already heavy load I was carrying, these light fluffy pillow guts dropped like a thud. As I scurried about trying to “clean up” the mess (that is so often my life), I caught a glimpse of my son, Oliver. That glint prompted me to take one of my favorite pictures of him. In the midst of that mess, he’s smiling. And not just a little smile, it’s an all out cheek-to-chubby-kissable-cheek grin. He doesn’t see the mess. He sees adventure, something new in our otherwise boring living room, and he sees me. How can we plant our stake firmly in gratitude? 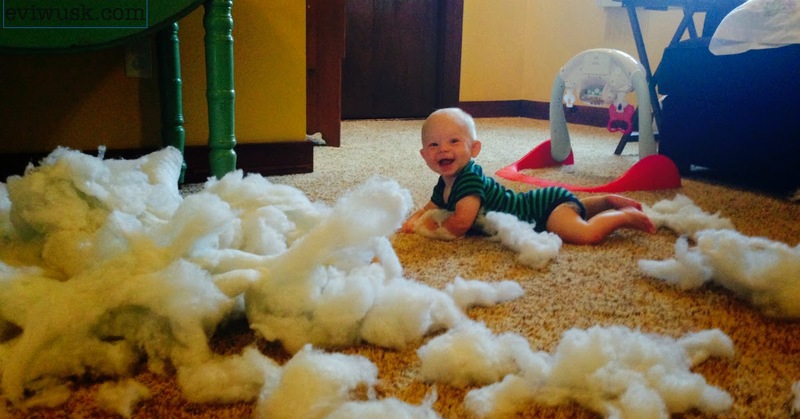 How can we, like Oliver, find ourselves smiling in the midst of the messiest days? Dogs eat pillows. It happens, and no self-help book or get-rich-quick-scheme can bullet-proof us against it. But we can practice. We can buff up our gratitude muscles, so that we might lift the weight off others, and find the strength to ask for help when we can’t lift the hurt off ourselves. And sure this sounds great when we’re zoomed up–either by a conference shifting our perspective, or in the quiet din that is today before today starts happening. There’s a reason that all of our iPhones are dinging at us. We forget; it’s called hedonic adaptation in the social sciences. It’s actually a really good part of being human, a survival skill–after you’re in the hog shed for a while you don’t smell the stink. We have an amazing ability to adapt, but this also makes us forgetful. I start my classes by saying, “Tell someone sitting next to you, I’m glad you’re here.” This reminds me to be grateful and to see the people around me. Plus, it always eases the tension and slows the pace. Once a month I have an iPhone task that tells me to come up with a new way to remember gratitude. My iPhone leaf picture reminded me on day one, but starts to be invisible after the novelty wears off, so I need reminding to change my reminder. I’ve told people I’m working on this (and to the tune of posting on social media. Yikes! No really, I am thankful to my friend Kelli Britten for challenging me to share myself as much as I share pictures of my kiddos). All joking aside, nothing gets me to follow through like accountability. If I’m on record as being the “gratitude gal,” maybe someone will call me out when I’m being an ungrateful troll. Thank you. You’ve stuck with me for the first week of the gratitude challenge! It’s been scary at times, but on the other side of scary is always adventure. So, find one itsy-bitsy way to treat yourself, to say, “Hey self, thanks for working at this.” Maybe it’s a new cup of herbal tea, a slick pen, or maybe just two minutes to just sit in the car before going on to the next thing. Please find one way to tell yourself from me and from yourself, thanks. Ritualize gratitude in your life in some small way. Use one of my ideas or come up with your own. And don’t forget to thank yourself for completing week one! *This post is part of a 30-day gratitude challenge. Subscribe via e-mail (on the left) or post a gratitude to WIN A FREE PIE HERE. I miss you Sara! Did anything become of that little notebook? I'm just going back through comments today. . . didn't have the guts to really focus on them when I was writing–scared it might have stopped my courage to keep posting! Hope you're having a good day!